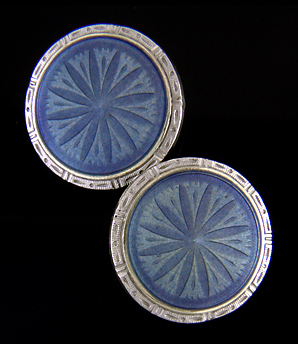 Krementz guilloche enamel cufflinks, circa 1925. Long-term readers of this blog are aware of my passion for guilloche enamel cufflinks. The gem-like enamels covering richly engraved patterns are miniature masterpieces equal to any precious gemstone. An example of guilloche enameling by Krementz & Company is pictured above. 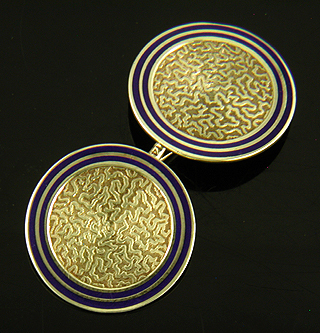 But, beautiful enamel work in antique cufflinks is not limited to dramatic guilloche centers. Enamel accents were often employed as borders framing engraved surfaces or gem-set centers. At other times, intricate enamel tracery was an integral part of the design, itself. The enamels added eye-catching color and contrast. British cufflinks with blue enamel accents, circa 1925. The above British cufflinks shimmer with intoxicating blue enamel borders surrounding intricately engine-turned (machine engraved) centers. The translucent enamel highlights an underlying ripple pattern. The wedding of deep blue enamel and warm yellow gold is inescapably elegant. During the 1920s and 30s, British cufflink makers created some of the most beautiful enamel and engine-turned cufflinks. British enamel work and engine turning may be a good topic for a future note. Another beautiful example of the artistry of British engine turning can be found at the end of this note. Larter "squiggle" cufflinks with dark blue enamel borders. Enamel accents were added to cufflinks using an ancient technique known as "champlevé." 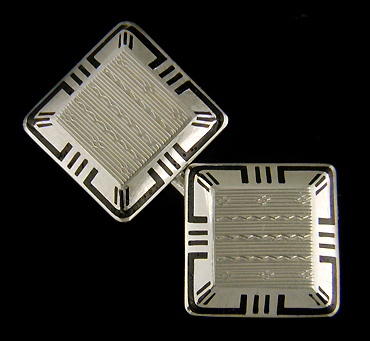 Under this technique recesses were carved or cast into the upper surfaces of the cufflinks. Then, vitreous enamels in the form of glass powder were fired in the recesses. The recesses served to both define the pattern of the enamel work and protect it. Once the cufflinks had cooled the surfaces were polished, creating a beautiful interplay between the colorful enamels and the precious metal. For example, the Larter & Sons cufflinks pictured above feature a double border of deep blue enamel set between polished bands of gold. The unusual center pattern is a myriad of twisting forms, a design we have nicknamed "Infinite Squiggles". 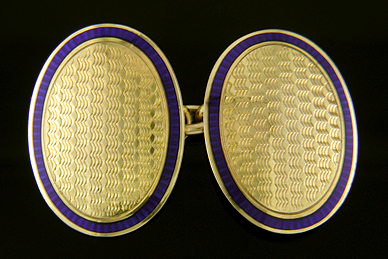 Larter had a knack for creating beautiful cufflinks with intriguing gold centers and striking enamel borders. Larter "Blue and Gold" cufflinks, circa 1925. Another example of Larter's virtuosity in creating beautiful cufflinks featuring richly detailed gold centers and dramatic enamel borders. The blue enamel borders frame stylized floral motifs. The radial symmetry of the design gives the cufflinks a mesmerizing kaleidoscopic effect. Crafted in 14kt gold around 1920. 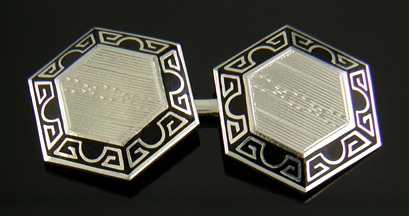 Richardson black-and-white cufflinks, circa 1930. In 1929 an exhibition of jewels in Paris challenged the early Art Deco penchant for vibrant, bold colors. At the exhibition striking all-white and black-and-white jewelry captured the imagination of designers and the public. During the 1930s jewels crafted in platinum or white gold were set with sparkling diamonds, black onyx, white pearls and shimmering dark enamels. These dramatic jewels came to define the striking elegance of the Art Moderne look. Cufflink maker's were not immune to the emerging fashion. Pictured above and below are striking black-and-white cufflinks created by the Richardson Manufacturing Company during the 1930s. Crafted in 14kt white gold, they feature centers of jazzy, wavy lines surrounded by dramatic black enamel borders. Founded by Enos Richardson in 1841, Richardson Manufacturing Company (originally Enos Richardson & Company) was one of the longest surviving American jewelry makers. Based in Newark, New Jersey, the firm created a broad range of jewels and accessories in silver and gold. The firm's striking black-and-white cufflinks from the Art Deco era are among the rarities of enamel cufflinks. Keller Arts & Crafts cufflinks, circa 1910. Another long-established American maker of fine cufflinks was Charles Keller & Company. Among the firm's creations were gold cufflinks accented with blue enamel designs. The cufflinks were crafted in 10 and 14kt gold and date from the early 1900s till the 1930s. The cufflink pictured above dates from the Arts & Crafts period (circa 1910) and features a striking blue enamel border that anticipates the bold, geometric designs of the later Art Deco period. For further examples of Keller blue and gold cufflinks see my earlier note Keller Blues. British engine-turned cufflinks, circa 1930. July is traditionally a quiet month in the jewelry trade. But, despite taking time to hike in the mountains with the beagle and watching the Tour de France, I have added several pairs of cufflinks, stickpins and brooches to the Antique Cufflink and Antique and Estate Jewelry Galleries. Recent additions to the Antique Cufflink Gallery include two beautiful enamel pairs - one British and one created by the quintessential American jewelry maker, Krementz & Company. Regal Blue Elegant cufflinks with regal blue enamels and striking Art Deco borders crafted in white gold. Engraved radiant starbursts are highlighted by the translucent enamel. Created by Krementz & Company in 14kt gold, circa 1925. Blue and Gold Elegant British cufflinks with engraved gold centers of rippling lines surrounded by beautiful blue enamel borders. Crafted in 9kt gold, circa 1925. Recent additions to the Antique and Estate Jewelry Gallery include two striking brooches and two equally beautiful stickpins. Serpent and Acanthus A fierce lion-headed serpent with a tail of flame-like acanthus leaves warily guards this brooch with a jealous green eye. A glowing pearl is set in the center. Created in 14kt gold, circa 1890. Amethyst and Pearls II A dramatic Art Nouveau brooch of undulating curves and entwined organic shapes set with a regal purple amethyst and five small pearls. Created by Bippart, Griscom & Osborn in 14kt gold, circa 1900. Acorns and Oak An oak leaf and two acorns suspend from a small branch. The oak leaf is beautifully enameled with shimmering shades of green, yellow and pink. The acorns are set with two small pearls. Crafted in 18kt and 14kt gold, circa 1900. Laurel Wreath and Moonstone The classical elegance of a wreath of laurel leaves surrounding a luminous moonstone. The laurel wreath is exquisitely crafted and detailed. Crafted in 14kt gold, circa 1900.